Overall world revenue for prefilled syringes will reach $4.3bn in 20151, and is expected to grow at a CAGR of 13% through 2020 when the market will account for nearly $6 billion2 thanks to increasing demand for chronic disease treatment, market entry of biologics and biosimilars, and innovative prefilled injection devices. Prefilled pen systems and auto-injectors will grow at a CAGR of more than 20% over the next five years. And while glass continues to remain the gold standard for prefilled syringes, the proportion of plastic-based prefilled syringes is expected to increase by 5% between 2015 and 2020, due to concerns of glass breakage and plunger failure. Prefilled syringes are simple compared with a traditional syringe and vial. The products reduce the number of steps required for drug administration while improving safety by reducing the potential for drug contamination, needlestick injuries and dosing errors. An increasing incidence of chronic disease means patients are requiring injectable drugs to self-dose at home, which is much easier and safer with prefills. Pharmaceutical companies can offer a premium and differentiate their brands with drugs sold in prefilled syringes. They can also reduce overfill of drug containers. Improvements in technology and manufacturing to lower levels of extractables and leachables and to cater to biologics and more sensitive drugs will encourage drug companies to switch to prefills. A number of prefilled syringe manufacturers have developed dual- and multi-chambered syringes, to cater to drugs that must be reconstituted at the point of delivery. This exclusive annual Drug Development & Delivery magazine report highlights several of the players in the prefilled syringe and parenteral manufacturing market. These companies are offering a range of services and systems that cater to today’s issues addressed above as well as anticipating the needs of the future. Althea is a leader in executing drug formulation and aseptic fill/finish for prefilled syringes and vials. Producing more than 2,000 lots of finished cGMP product in its facility, Althea provides clients with the capacity to advance projects through all stages of clinical and commercial development. Althea’s prefilled syringe contract manufacturing services include parenteral manufacturing on a high-speed prefilled syringe line that utilizes Restricted Access Barrier (RAB) technology to ensure the required sterility for fill/finish, explains Dr. Cannon. Althea also offers a range of batch sizes for prefilled syringe projects with media fill formats covering most configurations. The clinical manufacturing facility at Althea fills batch sizes of up to 20,000 prefilled syringes and batch sizes of up to 100,000 units for commercial-scale programs. 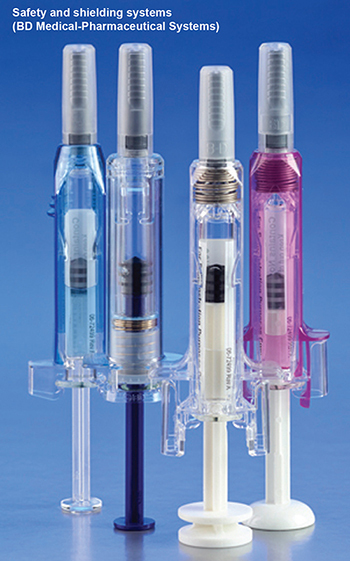 Althea’s INOVA H3-5V supports glass or polymer syringes ranging in sizes from 0.5-mL to 20-mL syringes. The syringe line runs at a rate of 13,000 syringes per hour and performs non-destructive weight checks, all within cGMP standards and FDA guidelines. In addition to aseptically filling of prefilled syringes, Althea has the capacity to fill liquid and lyophilized vials. Althea’s vial capacity for clinical programs include batches as small as 100 units up to batch sizes reaching more than 70,000 vial units. Vial volume sizes range from 0.5 mL to 100 mL depending on the client-specific needs of the drug product. Althea also offers cGMP lyophilization services in conjunction with fill/finish capabilities. “If there is an existing lyophilization process in place, Althea will transfer and adapt the lyophilization cycles to its equipment,” says Dr. Cannon. Althea’s VIRTIS Ultra 35EL lyophilizer has a maximum lot size of 6,100 x 2-mL vials and can fill a range of vial volumes from 2 mL to 50 mL. BioPharma Solutions (BPS), the contract manufacturing business unit of Baxter, partners with pharmaceutical companies globally to support commercialization objectives by providing formulation development, lyophilization development/optimization, sterile contract manufacturing solutions, parenteral delivery systems, and customized support services. As a global contract manufacturer in prefilled syringe fill/finish, BioPharma Solutions offers clinical through high-volume commercial sterile manufacturing. Redundant like-in-kind filling lines can help increase production potential, mitigate supply risk, and ensure on-time delivery. Baxter Scientist Greg Sacha cites advances in the industry with respect to syringe design, which include new types of components, changes to the manufacturing process to reduce the quantity of silicone used to coat the syringe, changes to the process to decrease tungsten and adhesive residuals, dual-chamber devices, and needle-free devices. 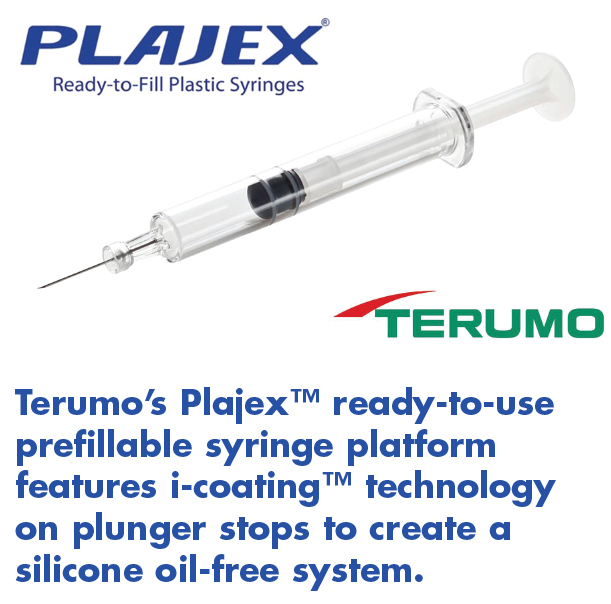 Advances in types of components include changes in the materials of construction such as the polymeric syringes changes in tip cap and plunger formulations as well as changes in the design of plungers. Plungers are seated by one of two mechanisms. BioPharma Solutions uses a mechanism that collects the plunger in stainless steel tubes that compress the plungers and a plunger insertion rod pushes the plunger into the syringe barrel. Compressing the plunger before placement allows air to escape around the plunger so that it will remain in place when it expands to fit into the barrel. BPS has expertise in filling glass and polymeric syringes using filling mechanisms that include time/pressure filling machines, rotary piston pumps, and peristaltic pumps. Syringe filling and stopper placement can be challenging considering the need to closely control the fill volume and the headspace between the liquid in the syringe and the bottom of the plunger. Additional challenges include interactions between the syringe components and the drug solution, especially for biologics. For example, a coating of silicone is needed on stoppers to improve their machinability. Baxter’s contract manufacturing site in Bloomington, IN, has an onsite research and development department that is experienced with the challenges of interactions of drug solutions with container closure components and has analytical equipment to aid in identifying and preventing potential problems. Along with BioPharma Solutions’ contract manufacturing services for pharmaceuticals in prefilled syringes, clients may leverage BPS’ expanded Drug Master File (DMF) for diluent syringes. Established DMFs have been successfully incorporated into client submissions for drug and biologic products. “By choosing a custom fill volume and labeling, while streamlining development work and process validation batches, and eliminating capital equipment costs, clients can considerably reduce time to market. Additionally, if a customer with a product currently in a vial decides to move their product from a vial to a prefilled syringe, BioPharma Solutions offers services to aid clients in making a seamless transition,” says Dr. Sacha. BD Medical–Pharmaceutical Systems offers a portfolio of drug delivery systems, including prefillable syringes, self-injection systems, and safety and shielding solutions, to meet the current and evolving needs of the pharmaceutical industry. In the past, global needlestick safety legislation has driven the requirement for prefillable syringes with staked needles to be equipped with needlestick safety to protect healthcare workers. However, as more drugs are being self-injected, it is important for safety and shielding systems to also incorporate a patient-centered design to support end-user needs. Improved ergonomic features, such as larger finger flanges and plunger rod heads can help provide additional support to users performing injections. “Improved patient outcomes have been documented in a recent article in the British Journal of Dermatology, where 100% of test subjects successfully self-administered treatment using a prefilled syringe equipped with the BD UltraSafeTM Passive Needle Guard,” says Sarah Baer, Strategic Marketing Leader, BD Medical–Pharmaceutical Systems. Additionally, pharmaceutical companies are developing more advanced injectable therapies that require expertise and innovation on the part of solution providers like BD. Many of these drugs must be delivered in higher volumes and at higher viscosities than has traditionally been the case. Furthermore, as the trend is to reduce overall healthcare costs by moving patient care out of the hospital/clinic and into the home setting, a focus on patient-centered design, acceptance, and adherence to these innovative drugs is critical. While traditional injection volumes are typically up to 1 mL, the latest formulations are pushing the boundaries, and a need exists for injection volumes up to 5 mL and larger. The market is demanding novel primary containers to support these drugs and delivery devices to enable self-injection, whether large volume autoinjectors or wearable patch injectors. “As a result, BD is leveraging its NeopakTM glass prefillable syringe technology to offer 2.25-mL prefillable staked syringes, as well as solutions to deliver up to 10 mL in a wearable patch injector,” says Paul A. Upham, Worldwide Director, Strategic Marketing, Self-Administration Injection Systems, BD Medical–Pharmaceutical Systems. Finally, the macro trends of an aging society, a rise in chronic conditions and healthcare reform are driving healthcare demand and costs. As a result, the healthcare industry is now increasingly focused on improving outcomes. A key way to achieve this is by addressing unmet needs related to self-care and treatment adherence. 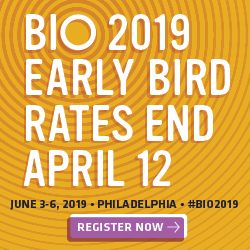 “BD recognizes the important role that interconnected and informatics-enabled (“smart”) medical devices can play in delivering targeted solutions that simplify and improve the quality of patient self-care while enabling providers to better treat and monitor their patients,” says Justin M. Wright, PhD, Senior Director, Strategic Innovation, BD Medical-Pharmaceutical Systems. When Credence MedSystems introduced its Companion Safety Syringe System last year, the paradigm shifted for a pharmaceutical company looking to launch an injectable drug in a differentiated delivery system. 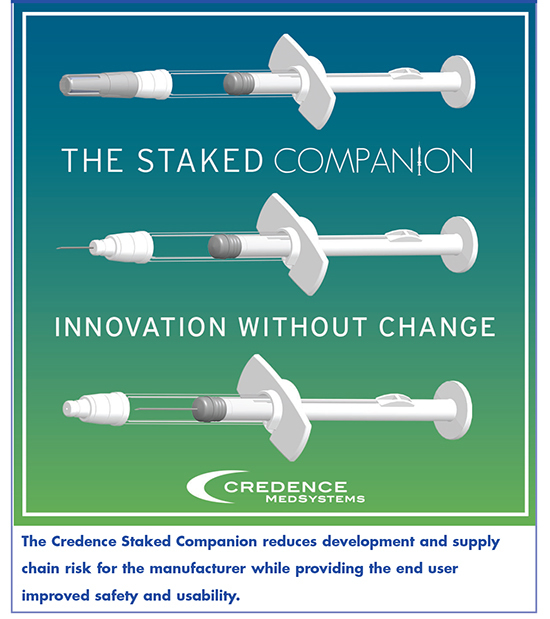 Credence’s Innovation Without Change design philosophy builds an integrated needlestick retraction safety device off of existing, commercially available primary package components. “By offering the innovation of the final device without the traditional changes to the primary package and supply chain that drive substantial development effort and risk, the Credence Companion addresses the critical needs of both the end user performing the injection and the pharmaceutical manufacturer commercializing the drug,” describes John A. Merhige, Chief Commercial Officer, Credence MedSystems. With its recently introduced Staked Needle version of the Companion, Credence has redefined ‘staked,’ keeping the desired and beneficial elements while eliminating many areas of concern with the conventional staked needle syringe, he continues. “As with any preattached needle, the user’s preparation process is simplified and the risk of attachment error is eliminated; the user must only remove the needle shield and then perform the injection.” Additionally with the Staked Companion, the needlestick safety is integrated into the syringe, allowing conventional syringe operations. Upon completion of the injection, audible, visual, and tactile cues signal that the injection is complete and then the needle automatically retracts into the barrel of the syringe and the syringe is permanently disabled. “Born from the Innovation Without Change philosophy, the Staked Companion allows the pharma company the flexibility to source from its preferred vendors and choose from existing syringe barrel, plunger, and needle shield primary package components. This capitalizes on the efficiencies of using existing components with a performance history, permits the components to be matched with the requirements of the drug product and application, and minimizes supply chain risk,” says Mr. Merhige. The Companion is compatible with ready-to-fill or bulk syringe processing and the filling process is unchanged. The Companion plunger rod and finger flange (if desired) are assembled after filling using conventional secondary packaging processes. Building the Companion off of a platform of existing primary package components simplifies the commercialization path for the pharmaceutical manufacturer, but additionally, the Staked Companion offers solutions to other challenges faced during combination drug-device development. For instance, the challenges and risks stemming from the presence of adhesives (conventionally used to mount needles), residual tungsten (an artifact from the syringe manufacturing process), and silicone (for lubrication) are well known within the industry. Adhesive, tungsten residue, and excessive silicone have been shown to lead to protein aggregation with sensitive biologics, and the adhesive application also carries risk of needle occlusion. The Staked Companion is glue-free and allows for a tungsten-free delivery device. The elimination of glue from the needle-mounting process carries with it other important benefits; the Staked Companion is compatible with baked-on silicone, silicone-free and silicone-immobilizing lubrication techniques, which allow greater control of the silicone content, and the pre-attached needle can be virtually any length or gauge. “With the Staked Companion Syringe, pharmaceutical manufacturers can launch their drugs in a device that provides a safe and improved user experience, drives compliance with needlestick safety regulations, eliminates many challenges in the development and regulatory process, and achieves a differentiated market position, providing a simplified path to a next-generation differentiated device,” says Mr. Merhige. Elcam Medical, a provider of disposable medical devices to the U.S. and European OEM markets, has developed a line of drug delivery devices designed for administration of biopharmaceutical drugs. In recent years, Elcam Medical, and its E3D (Injectable Drug Delivery Devices) Division, has been focusing on developing and manufacturing high-quality and patient-compliant autoinjectors for biologic drugs and other self-injectable drugs. The Flexi-Q Drug Delivery line includes a range of disposable autoinjectors and multi-use autoinjectors designed to maximize user compliance. This product line provides a range of customization options such as low-high viscosity, liquid or lyophilized, prefilled syringes and vials for safe and simple injection, says Dr. Zucker, Vice President, Head, of Elcam Drug Delivery Devices. 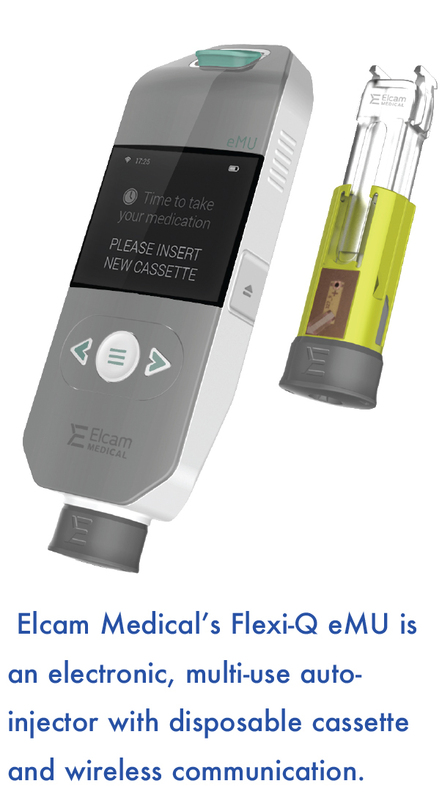 Elcam’s newest auto-injector under development is the Flexi-Q eMU, an electronic multi-use autoinjector. The Flexi-Q eMU-P comprises a reusable driving unit and a disposable cassette and is compatible with standard PFSs containing biologics or cartridges suitable for variable dosing. The Flexi-Q eMU-C is comprised of a reusable driving unit for use with standard 1.5-mL – 3-mL cartridges suitable for variable dosing. The Flexi-Q eMU is intended for use with chronic diseases that require frequent injections. The reusable design lowers the cost per injection and reduces the volume for storage and disposal. Features include a reusable driving unit with a disposable cassette utilizing standard prefilled syringes, USB communication port, RFID drug detail recognition, and wireless communication to remote database. Developments in prefilled syringes add to the tools an ophthalmologist can rely on to successfully treated diseases. “Recent developments in prefilled syringe treatment has caused a shift from surgery to injection, and brings therapy options to patients who could not be cured previously,” says Bernd Zeiss, Manager Technical Support Medical Systems, Business Development, Gerresheimer. The two largest eye therapy areas are the anterior segment of the eye where cataract surgery is performed, and the inner eye, which can be affected by diseases such as wet macular degeneration, diabetic macular edema (DME), and retinal vein occlusion. In cataract surgery, the opaque lens is basically removed and replaced by an intra-ocular lens (IOL). In order to protect the delicate cornea cells during surgery, a prefilled syringe is used to administer hyaluronic acid into the cavities of the anterior chamber and lens. The other field of applications comprises treatment of the inner eye by intravitreal injections of monoclonal antibodies to prevent the growth of veins, corticosteroids to fight bacterial infections, and silicone oil to fix the retina to the eye after retinal detachment. In addition to patients, eye surgeons benefit from these prefilled syringe developments. “A prefilled syringe is handy and ready to be administered. New application systems substitute the classic vial filled with liquid or lyophilisate. Compared to a vial in combination with a disposable syringe, many preparation steps can be skipped by using a prefilled syringe. Dose errors are minimized, as the syringe already comes with the filled volume in the right concentration,” says Mr. Zeiss. Nevertheless, there are challenges with prefilled syringes. In contrast to vials, prefilled syringes are siliconized for lubrication and even if silicone oil is absolutely harmless to the human body, it may have an impact on vision. Gerresheimer’s Baked-on® siliconization offers a solution, as this lubrication method reduces the amount of freely floating silicone oil droplets by more than 90%. Performance of baked-on staked-needle syringes have been tested with a variety of different plunger stoppers. “Breakage of a syringe is an extremely rare event, but with glass syringes, in combination with highly viscous liquids administered by high pressure, surgeons and patients are afraid of this kind of failure,” says Mr. Zeiss. In addition, eye surgeons need a good grip of the syringe. 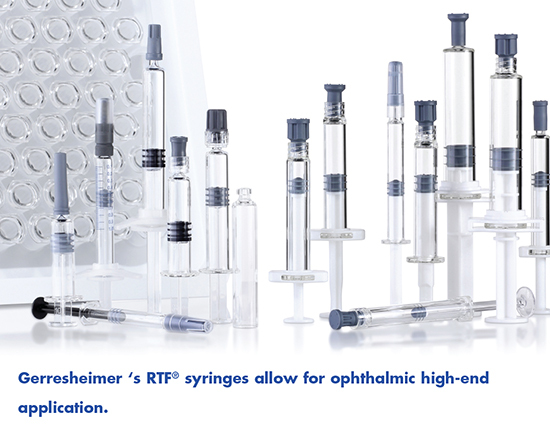 RTF® syringes by Gerresheimer address these problems by the TELC® closure. Aside from offering a tamper-evidence feature, this Luer lock closure is fixed tight to the cone so loosening is hardly possible. As an alternative, ClearJectTM COP-syringes can be used. This syringe is unbreakable, and the Luer lock adapter and syringe are one piece that cannot be loosened. 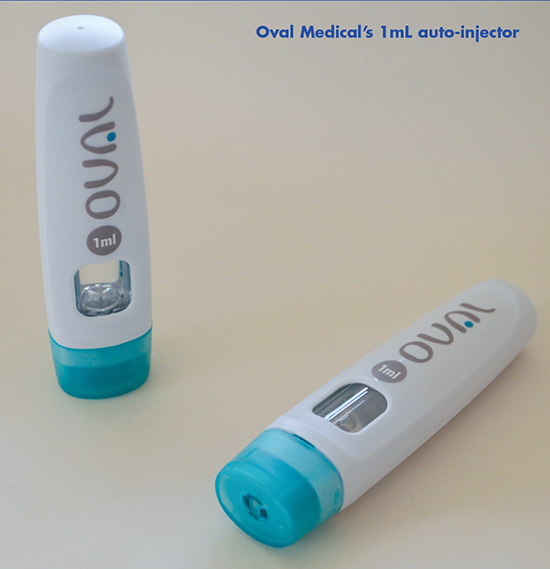 Oval’s autoinjector technology was developed to satisfy unmet needs in the market to provide a novel primary drug container that resolves many of the fundamental limitations of glass syringes in existing autoinjectors, especially suited for biologics; a patent protected PDC closure/seal technology (cup seal and foil); improved reliability and safety; and patient-intuitive use, with no visible needle that is virtually error free. 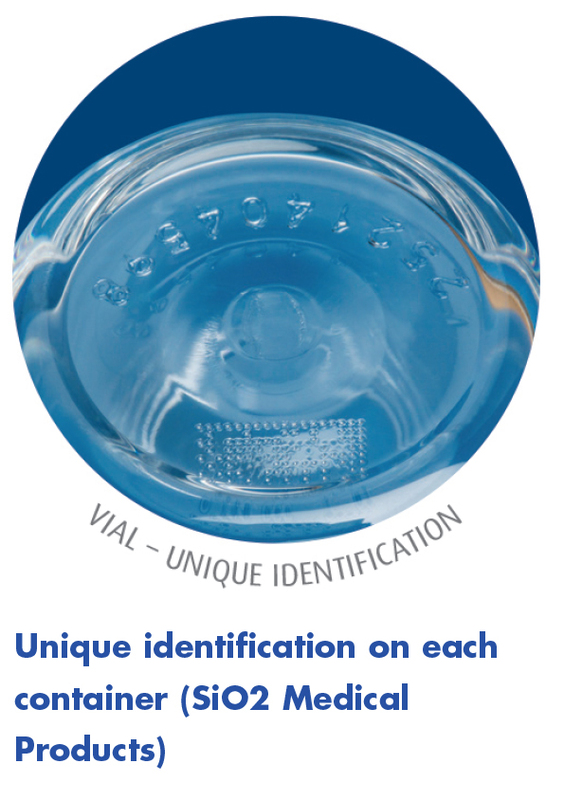 Oval’s PDC technology uses advanced plastics, cyclic olefin (COC), to replace the glass syringes used in autoinjectors and the unique cup seal and foil PDC closure technology forms the basis of a smooth operation of the injection system, explains Mr. Deleeuw. The Oval design eliminates many of the issues that arise from glass syringes, including contamination by silicone/tungsten that cause degradation with biological drugs, drug adsorption to the glass, delamination of glass resulting in particles that can be injected, inconsistent injection times arising from sticking rubber plungers that result in the patient removing the autoinjector before the dose has been completely delivered, and unsuitable-for-delivery of formulations with viscosities greater than 15 cP. Key features of the Oval autoinjector that confer improved patient acceptability include small size, ease of self-administration, concealed needle, and reduced needle-stick injuries thanks to a lock-out mechanism. Devices can be designed for different users by modifying only the outer shell while still using the same autoinjector mechanism and primary drug container, Mr. Deleeuw points out. It’s been more than two decades since the FDA approved a new industrial sterilization method. That long streak came to an end in May 2014 with the FDA 510(k) clearance of the OsteoSymbionics® pre-sterilized CLEARSHIELD®, a Class II cranial implant, using the REVOX® sterilization technology. The device had previously been 510(k) cleared using Ethylene Oxide (EO), a sterilization process performed in-hospital prior to surgery. The REVOXTM technology was developed as an extended application for a Cantel Medical Peracetic Acid (PA) liquid sterilant, a market leader in the endoscope reprocessing field. The ability to achieving full sterilization via room temperature vaporization opens new opportunities to expand the range of materials suitable for use in advanced medical devices, biologics, and pharmaceuticals, and offers operational flexibility and efficiencies that were previously constrained by traditional sterilization methods. REVOX sterilization started with an idea. Mason Schwartz, co-inventor and Lead Technical Advisor for REVOX Sterilization Solutions says the invention sprung from the knowledge that the PA chemistry was unparalleled in terms of efficacy and materials compatibility for liquid disinfection. “It consistently proved to be the most stable, gentle, fast, and effective solution in the world of endoscopy reprocessing,” he says. “We knew we had a special formulation, but liquid disinfection has obvious limitations in terms of the types of things that can be sterilized using it.” Nevertheless, Mr. Schwartz had the basic chemical formulation and he went to work to find a new and more effective sterilization process with PA in vapor form. The room temperature REVOX process offers potential for removing challenges associated with other sterilization methods such as material compatibility issues resulting from elevated temperatures and chemical residuals, while achieving sterility assurance levels of 6 log or greater. “We’re still exploring our limitations in terms of material compatibility but we’re having success with the most advanced innovations that incorporate sensors, batteries, large molecule formulations, and other new innovations,” says Mr. Schwartz. SHL designs, develops, and manufactures a range of drug delivery devices such as autoinjectors, pen injectors, and inhalers that address existing and upcoming needs of injectable medicines. This includes the ability to accommodate various primary containers, higher drug viscosities and larger delivery volumes. With the goal of improving patient compliance, SHL’s portfolio includes devices with simple operations, ultra-compact designs, ergonomic exteriors, and innovative feedback systems. As self-administered injections become available in more therapies, device designs have to be adapted for different patient populations. “The application of human factors/usability engineering is essential to minimize user-related risks, enhance ease-of-use, and ultimately allow end users to handle the device safely and effectively,” says Nicholas Heaton, Executive Director of Business Development, SHL. Involving targeted patient groups in user studies early during research and development can help engineers better understand patient dynamics and ensure their needs are integrated into the device design. For example, patients with Rheumatoid Arthritis (RA) can have certain dexterity issues that affect their ability to uncap or grip a device properly while administering an injection. A device with more tailored uncapping and grip designs can aid users with such conditions. 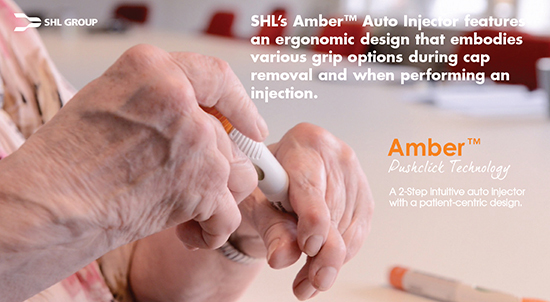 SHL’s AmberTM Auto Injector features an ergonomic design that embodies various grip options during cap removal and when performing an injection. In addition, unique surface extrusions around the cap and the viewing window create an additional friction area for better handling. Utilizing SHL’s PushclickTM technology, the Amber Auto Injector can be operated in just 2 steps – uncap and inject — and integrates essential safety features such as a permanently hidden needle and a range of audible, visual, and tactile feedback mechanisms, explains SHL Chief Industrial Designer Jochen Ratjen. While design considerations of a patient-centric device is paramount to the success of combination products like autoinjectors and pen injectors, designing for manufacturability is just as vital to ensure that the product is producible at high volumes. SiO2 Medical Products (SIO) is a vertically integrated manufacturer of primary containers. Building on its plastic technology knowledge, SiO has brought new solutions to the traditional challenges with plastic and glass containers. Using patented advanced materials science, SiO has developed a line of parenteral drug containers that offer improved performance and consistency over existing plastic and glass containers, says Peter Sagona, Vice President, SiO2. SiOPlasTM containers are precision molded from medical-grade polymers with a thin, transparent, silicon oxide-based coating applied to the interior surface of the container. “This allows our parenteral containers to provide customers the durability of plastic with the high purity and barrier properties of glass, while eliminating the shortcomings of existing glass and plastic containers,” says Brian Fitzpatrick, Program Manager, SiO2. More complex drug formulations and an ever-increasing focus on the quality and safety of injectables requires a new approach in parenteral packaging. Mr. Sagona says SiOPlas containers provide a number of improvements over existing plastic or glass containers, such as track-and trace compability. During the manufacturing process, a SIO laser etches a unique 2D bar code and/or serial number onto each individual SiOPlas container. This is a GS1-compliant tracking ID. Additionally, during the manufacturing process from bead to finished container, SiO performs more than 6 in-process, non-destructive quality checks on each SiOPlas container, such as scanning the interior surface to assure a particle-free container down to 50 microns. Another improvement is there are no leachables/extractables. The silicon-oxide barrier coating system applied to each container provides a barrier to any leachables. In addition, SiOPlas containers use no silicone oil, so aggregation will not be seen. 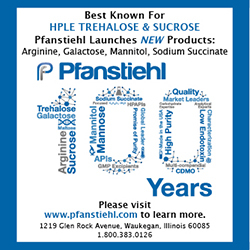 Additionally, SiO’s containers are stable across a wide pH range, minimizing the need for reformulation. And, the pure silicon-oxide plasma coating applied to the container interior provides an oxygen barrier similar to containers constructed of glass, and because it is pure SiO2 there are no heavy metals or trace impurities typically found in borosilicate glass, eliminating the mechanism of delamination. “With these advances, the drug product will see improved shelf-life and reliability,” says Larry Thomas, Head of Business Development, SiO2. The pharmaceutical industry is challenged by new regulations and complex drug products that require new and innovative delivery techniques for patient care. Regulators are requesting that the industry seek improvements in drug administration, quality and safety, and risk mitigation of drug degradation. In addition there is a renewed focus on improving the therapeutic outcome and patients’ quality of life. Several issues related to traditional primary drug containers and prefilled syringes may add to these challenges and/or generate other problems, such as silicone oil interaction, tungsten, aggregation, (sub-) visible particles, and glass delamination/breakage. Furthermore, proteins and monoclonal antibodies are complex large molecules often requiring high concentrations to obtain the immunogenic response. This can create injectability challenges due to viscous effects of high concentrations of drug products. The introduction of advanced technologies and application of specific know-how for parenteral drug delivery, such as polymer-based prefillable syringes and the application of a novel silicone oil-free system (i-coatingTM technology), can address many of these issues and challenges effectively. The industry trend toward self-administration continues to drive to an ever-increasing demand for easy-to-use delivery systems such as prefilled syringes, pens, and autoinjectors with the goal of patient safety, compliance, and convenience. In addition, regulatory guidelines with regards to combination products and safety features have an impact on the prefilled syringe design and the requirements for medical devices. And along with new innovative materials, there is also a strong development in the primary and secondary packaging for syringe systems that enable more product-specific handling. In response, Vetter offers several options for the drug serialization. These include the availability of different serial number and code formats, interfaces and reports, and various aggregation depths. West Pharmaceutical Services, Inc., has made several advances in drug packaging and delivery systems and materials in recent years. The company’s NovaPure® components, which include FluroTec®-coated closures provide quality for sensitive biologic drugs and combination products, and have been incorporated into West’s primary containers and prefillable solutions. West also offers Daikyo Crystal Zenith® (CZ) prefilled syringes for biopharmaceutical and pH-sensitive drug products that have unique packaging requirements. 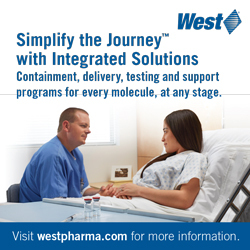 “West has combined its packaging knowledge with innovative delivery systems in order to better meet the needs of patients and healthcare providers,” explains Graham Reynolds, Vice President, Marketing and Communications, West Pharmaceutical Services, Inc. The ConfiDose® autoinjector system technology platform can be used with a CZ 1-mL insert needle syringe or traditional prefillable syringe. The SmartDose® electronic wearable injector and features a CZ-prefilled cartridge. “These platforms offer a range of options for dose volume and injection time and are designed to help improve patient compliance and outcomes, while meeting the challenges of today’s innovative drug products,” he says. To help ensure safety of patients when using its drug containment and delivery solutions, West also offers solutions to guard against needle-stick injuries. West has developed an portfolio of offerings that enable safe and effective drug administration, including a range of active and passive safety systems. 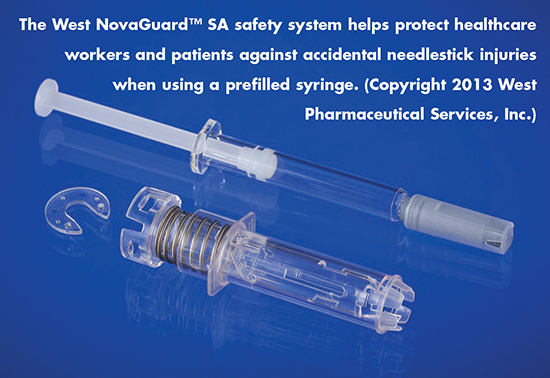 The NovaGuardTM SA (staked-needle automatic) safety system is a user-controlled safety system that shields the exposed needle of a prefilled syringe before and after injection, which helps reduce the risk of accidental needlestick and the transmission of bloodborne pathogens. West’s NovaGuardTM LP passive safety system for Luer lock syringes features a plastic shield surrounding the needle before injection. Once the needle is pressed to the skin, the protective shield is activated and covers the needle as it is withdrawn. Additionally, West’s érisTM passive safety system is used for staked needle prefillable syringes outside of North America to reduce the risk of needle-stick injuries. 1. Pre-Filled Syringes Market Forecast 2015-2025: Prospects for Leading Companies in Plastic Pre-Filled Syringes, Pen Injectors & Autoinjectors, and Glass Pre-Filled Syringes, Visiongain, (https://www.visiongain.com/Report/1397/Pre-Filled-Syringes-Market-Forecast-2015-2025), February 2015, accessed April 14, 2015. 2. Pre-Filled Syringes Market: 2015 – 2030 – Opportunities, Challenges, Strategies & Forecasts, Reportlinker, Nov. 13, 2014, http://www.prnewswire.com/newsreleases/the-pre-filled-syringes-market-2015—2030—opportunities-challenges-strategies–forecasts-282630371.html, accessed April14, 2015. 3. The Future of Alliances and Partnerships in the Pre-Filled Syringes Market to 2020, Smithers Rapra, February 2015, http://www.eandlconference.com/news/2015/february/global-market-for-pre-filled syringes-forecast-to, accessed April 14, 2015.